CC Bicycle Gallery: Doug Shaker's Centurion Mixte "Tyrone"
This project began when a good friend of my fiance admired a mixte I had fixed up for my fiance. I asked "would you like one like it?" and was surprised to find that the answer was an enthusiastic "Yes!" Mixtes frames are tough to find, but I have a friend that fixes up old bikes for a battered women's shelter. 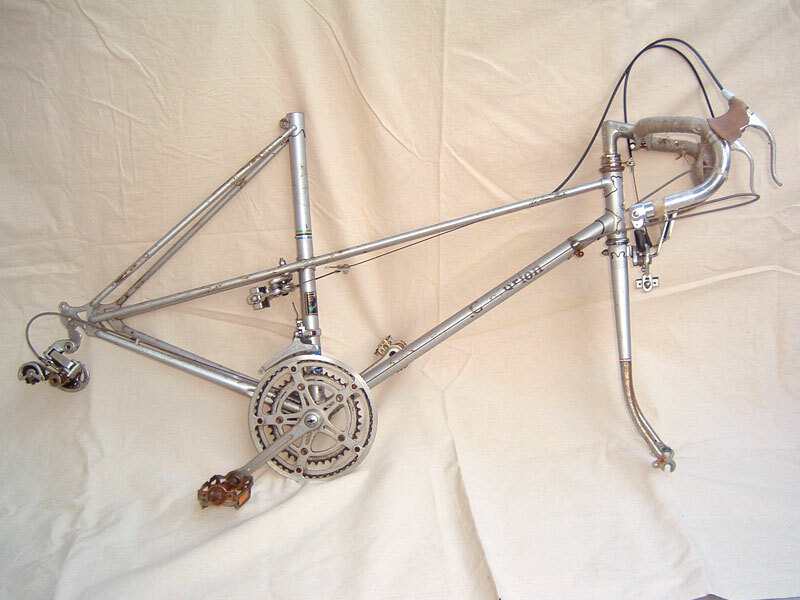 Mixtes aren't very popular with his clientele, so the mixte frames tend to get stripped for parts and left to rust. I went over to inspect what he had and I found an old Centurion LeMans from the seventies that was the right size, but it was rusted pretty bad and would need a repaint job. One of the pictures shows the frame as I received it. The first step was to strip the frame. The crank was frozen to the pedals and the pedals were rusted beyond repair. The DiaCompe centerpull brakes were fine, just needing a little cleaning up and new brake pads. Biggest problem was the stem. It was corrosion welded to the head tube and no amount of banging, twisting, or cussing would get it out. Fortunately, I got some good advice from the Rivendell Bike Works email list and, after soaking the head tube in ammonia for a week, I was able to remove the stem from the head tube. The banging, twisting, and soaking had done in the headset, though. I sent the frame off to the powder-coating folks and tried to get a light sparkly blue. I got a blue darker than I expected, but I liked the result, nonetheless. The rest of the build was pretty straight forward. The interesting parts are mentioned below. 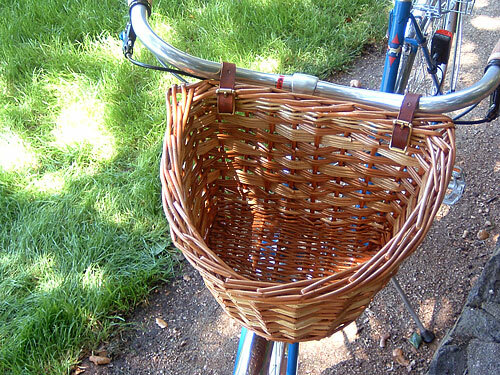 The front basket was hand-made by a British basket maker named David Hembrow. Not cheap, but very nice work, very nice indeed. http://www.hembrow.eu/bicycle.html The rear basket is a Wald with a stretchy red cargo net to hold stuff in. The fenders are Gilles Berthoud as is the mudflap. The rims are Gentleman 81 Super Champions and the hubs are Shimano 105s. The tires are Rivendell Ruffy Tuffy, 700cx28. 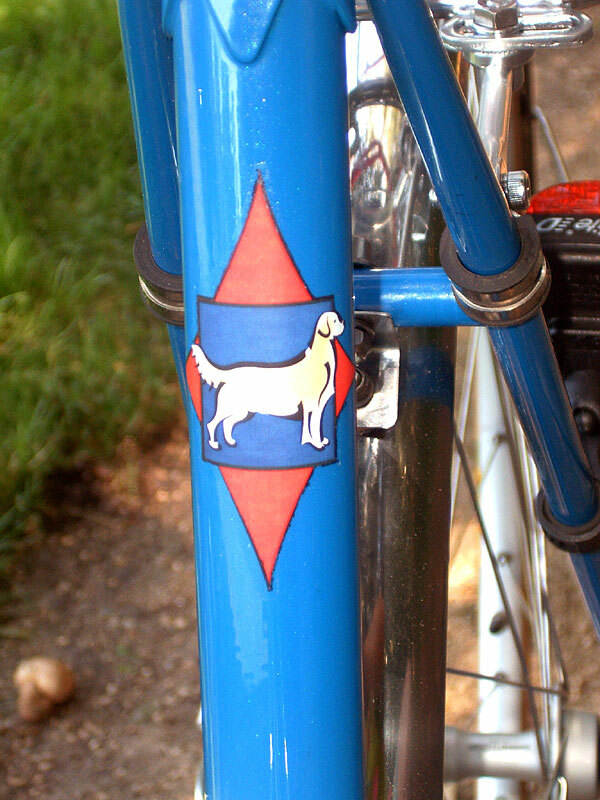 The handlebars are Nitto Albatross on a Nitto Periscopa stem, with cork handles from Rivendell. The crank is a Sugino XD300, 165mm, with 46-36-26 chainrings. The pedals are MKS sneaker pedals. The gear cassette is a Shimano 28-24-21-19-17-15. The shifters are Rivendell Silver bar-mounted silver shifters. The rear derailer is a cheapo SunRace 517. 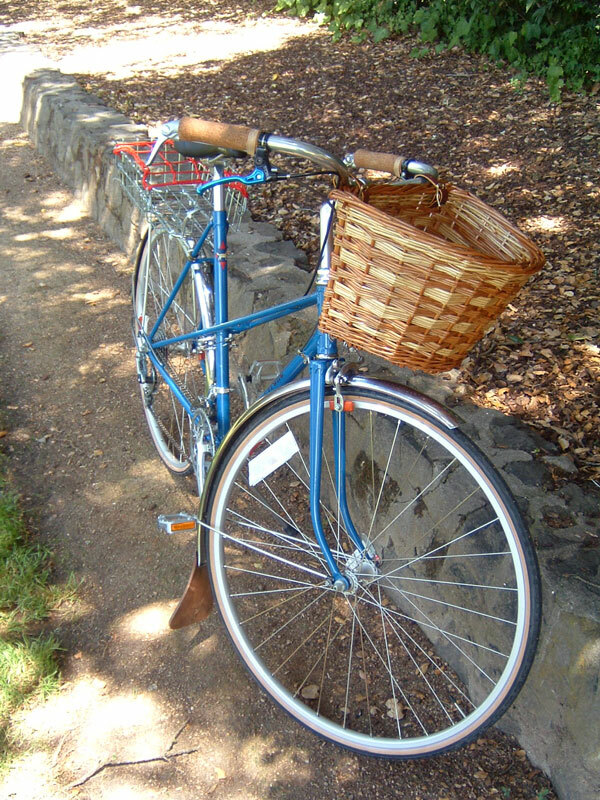 The front derailer is an old Suntour Sprit. This derailer shifts in the reverse direction of regular front derailers. This means that, for the user, moving a shift lever down, on either side, always increases the difficulty of pedaling. This makes it easier for inexperienced riders to remember how to shift. 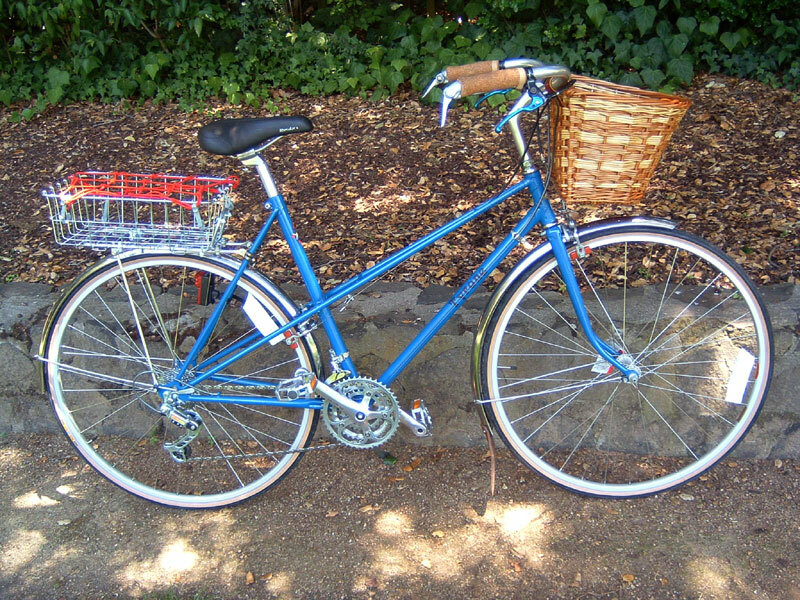 The result is an easy to use, easy to ride, kind of French-go-to-market bike. My fiance's friend loves it. A final note on the decals. My fiance's friend had, for a long long time, a Golden Retriever named Tyrone. After years of companionship, he died a few years ago. The decals are a tribute to Tyrone.